1a. The name of the Club shall be ‘The Herne Bay Amateur Rowing Club’. To foster good relations within the Club and to encourage social activities between members and with other Clubs. 2. The Club shall consist of a president, vice presidents, rowing members and non-rowing members (all being full members) and family members. The spouse/partner and any children under the age of 14 of any full member shall be entitled to become family members without the necessity of being elected to membership. All full members over the age of 18 shall have equal voting rights, but members under 18 and family members shall have no voting rights. 3. The colours of the Club shall be blue blazer, royal blue singlet with white Maltese cross and navy blue shorts. No member shall row in a regatta unless in club colours. 4. The Committee shall comprise of the Chairman, the Vice Chairman, the Captain, the Vice Captain, the Hon. Treasurer, the Hon. Secretary, the Regatta Secretary, the Welfare Office, the Safety Officer, four rowing members and non-rowing members, all to be elected by simple majority vote at the Annual General Meeting. All officers, including the President and Committee members shall retire from office annually, but shall be eligible for re-election. No member shall be eligible for election to the Committee unless he/she has been a member of the Club for at least two years. 5. The Annual General Meeting shall take place before the end of January each year. 6. Annual subscriptions shall be such sums as shall be determined from time to time at a General Meeting. The Committee shall have absolute discretion to accept a reduced subscription from any member. 7. Subscriptions shall become due on 1 October each year. No member shall take part in any regatta unless the appropriate annual subscription has been paid in full. 8. The Committee shall meet at least once a month, and special meetings may be convened on the proposal of seven or more members. 9. Any rowing members who may be present shall, if requested, assist in the launching, landing and housing of club property. 10. The stroke person must report in writing to the Captain or Hon. Secretary any damage to boats or blades. 11. Crews for regattas shall be selected by a selection panel, comprising the Captain and two members to be nominated by the Executive Committee annually. 12. The Club’s representative to the CARA Committee shall be elected annually by the Committee at the first Committee meeting held after the Annual General Meeting. 13. The entrance fees and boat expenses for Club crews contending in regattas with the consent of the Committee shall be out of Club funds. Such crews shall row in club colours. 14. No Club boat shall be put afloat unless in the presence of a nominated experienced person or with the specific authority of the Captain, Vice Captain or a past captain. Names of such persons shall be posted on Club notice boards. 15. All boats and blades shall be properly housed and washed down after use. 16. The Hon. Treasurer shall present the audited accounts at the Annual General Meeting. 17. All members must be amateurs according to the definition of CARA. CARA’s rules governing boat racing are to be strictly observed. 18. Amendments or additions to these rules may be made only by simple majority decisions of members at a General Meeting, save that amendments or additions to this rule (18) or rule 1b shall only be made upon 75% of the entire membership of the entire Club voting in person in support of such amendments or additions at a General Meeting. 19. The Committee shall have the power to make by-laws* in respect of matters concerning the general administration of the Club. 20. A General Meeting may be called by the Committee or by written requisition to the Hon. Secretary signed by any ten members of the Club. A General Meeting shall not be held until notice of the date of the meeting has been displayed on the Club notice board(s) for a period of at least 14 days. 21. The Club shall not be dissolved except by a majority of three-quarters of the Club’s entire membership present and voting at a General Meeting. Upon dissolution of the Club, any surplus assets and monies shall be passed to CARA to do with as they see fit, with the request that they be given to clubs in need of equipment and financial support. 22. The Club shall elect Trustees in whom shall be vested all property belonging to the Club. 23. Any member wishing to be considered as a coxswain must give evidence to the Hon. Secretary that he/she can swim at least 50 metres. 24. The keys of the boathouse and clubhouse shall be held by those members nominated by the Committee. 25. The Committee may elect a Social Committee to supervise social events and catering, but the Committee itself shall retain responsibility for the purchase for the Club and the supply by the Club of intoxicating liquor. 26. The Captain shall be responsible for keeping the Boathouse in an orderly manner and may request any rowing member to help him/her. 27. The Captain has authority to detail one day per week for maintenance, and no boats shall be taken out on that day. 28. Membership of the Club shall be open to individuals of any age who are interested in furthering the aims of the Club. Applications for membership shall be submitted in a form prescribed by the committee, accompanied by the relevant subscription fee. Election to membership shall be made by a simple majority vote of those persons present and voting at a committee meeting. If membership is denied, the person concerned must be informed in writing of the decision and given a good reason why they will not be admitted to membership. No potential member shall be denied membership of the club for any reasons that may be considered discriminatory. Any monies paid shall be refunded. That person shall then have a chance to appeal against the decision, accompanied by a friend, at the next committee meeting. 29. Members may bring guests to the Club, but no member shall, except with the approval of the Committee, introduce any person as a guest to the Club on more than five occasions in any one year. A member inviting a guest shall, on entering the Club, insert the name of the guest in the guest book and sign the entry. The member shall be responsible for the conduct of his/her guest and shall not leave the Club premises before his/her guest. The Committee shall have absolute discretion to refuse entry to the Club of any guest. 30. The Committee shall have the power to expel any member if, in the opinion of the Committee, his/her conduct has been or is likely to be prejudicial to the character or interests of the Club. The Committee shall not, however, expel any member without giving given him/her the opportunity to explain his/her conduct. The Committee shall make any decision as to expulsion on a simple majority of those persons present and voting. Bona fide guests of rowing members, non-rowing members or vice presidents, but such guests shall not be entitled to purchase intoxicating liquor. 32. Intoxicating liquor may be sold to visitors to the Club, being members of other sports clubs attending for the purpose of participating in sporting activities with the Club, together with their bona fide guests. 33. The permitted hours for the supply of intoxicating liquor in the Club shall be such as are fixed from time to time by the committee and details of which shall be posted on Club notice boards(s). 34. Any oars person requesting entries to a regatta and failing to attend, without giving good reason to the Captain, shall be held responsible for the full entry fee. 35. The Club will abide by the ARA “Good Practice in Rowing” guide to protect the welfare of members under the age of 18. If the stroke person requires and is entitled to a Boathouse key, he/she must pay for it, and the Hon. Secretary or Hon. Treasure must be informed of them having a key. Rowing members should, if asked, prove that they can swim a minimum of 50 meters. Boats for training are to be allocated by rota and at times approved by the Captain and Vice Captain. If no subscriptions have been paid (due on 1 March), no equipment is to be used (this includes ergos and weights). At the captain’s discretion, there may be a designated evening to the training of novices. No serious rowing is to take place during this time. 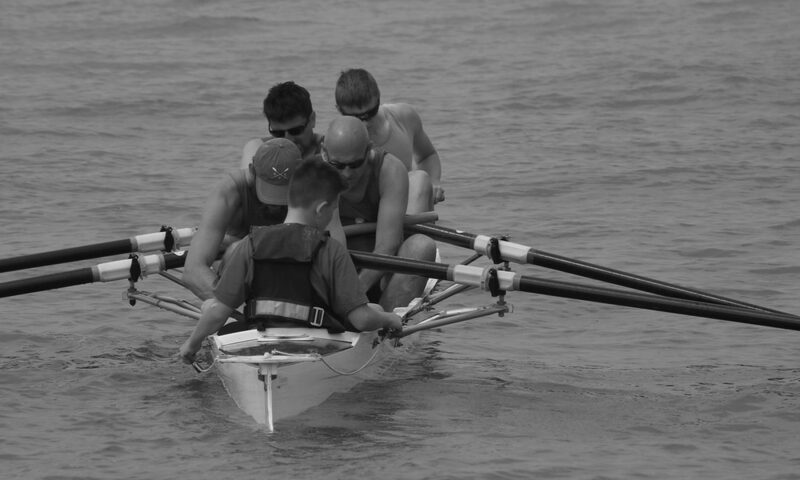 Experienced rowers are requested to be present to take novices out in order to train them up. All boats must be signed out and in, including times of departure and return. Any damage to the boats or blades should be reported to the Captain or Vice Captain by the stroke. When inexperienced rowers in small boats are on the water, the Captain, the Vice Captain or a nominated experienced oars person must be on the beach or in a four boat, ready to assist. Equipment is there for everyone to share in equal amounts. It is the responsibility of all members of all crews to attend boat loading and unloading and to make sure that their relevant boats, blades, seats, etc. are loaded onto the trailer. If things have been left off and a crew has not been in attendance it is their responsibility. Rowers who cannot attend boat loading for a good reason, must let the Captain or Vice Captain know in advance. A crew or individual rower must not enter a race two statuses above their status unless they are prepared to pay their own entry fee. Rowers will also be liable for entry fees if they miss their start. Late entries should be kept to a minimum to save costs. Fines from umpires shall be paid by individual rowers. To use the equipment at Plucks Gutter you must obtain permission from the Captain or Vice Captain. This includes taking the river boat away to regattas/head races. The key to the Plucks Gutter boat house will be held by the captain. The seats must also be returned to the boathouse after each outing. Remember that we are guests at Plucks Gutter and any unacceptable conduct or lack of respect may result in us being denied use of the facilities. You must adhere to UKC’s rules of conduct. Whilst at Plucks Gutter you must respect other people’s equipment and keep the boathouse tidy at all times. You must not borrow equipment (including tools, footstraps, trestles, etc.) without prior permission. Any and all incidents that resulted or could have resulted in injury to any individual and/or damage to any boat must be entered in the Incident Log Book kept next to the lockers. Repairs to damage are the responsibility of the individuals using the equipment at the time and must also be entered in the Incident Log.